Take a Break's Su-doku gives you 80 great su-dokus along with innovative variations, like the ever-satisfying 16x16 grid, to keep boredom at bay for hours on end. Besides these great puzzles, there's also a chance to win a great cash prize every month. 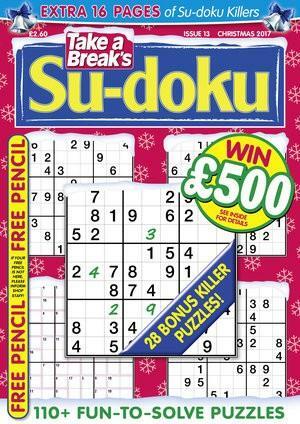 Be the first person to tell us what you think about Take A Break&apos;s Su-doku and you'll save £2.50 on your next purchase!